Lace and Buttons and Bows, oh my, but I forged ahead anyway and this is the result. I pulled a piece of paper from my sprayed backgrounds box, layered it with Soft Suede and Brushed Gold. It was very interesting how the ink looked a little different depending on where I stamped it on the sprayed paper. Tissue tape, lace, buttons, hemp cord, seam binding, a trinket pin, and distressing the edges rounded out the finished piece. 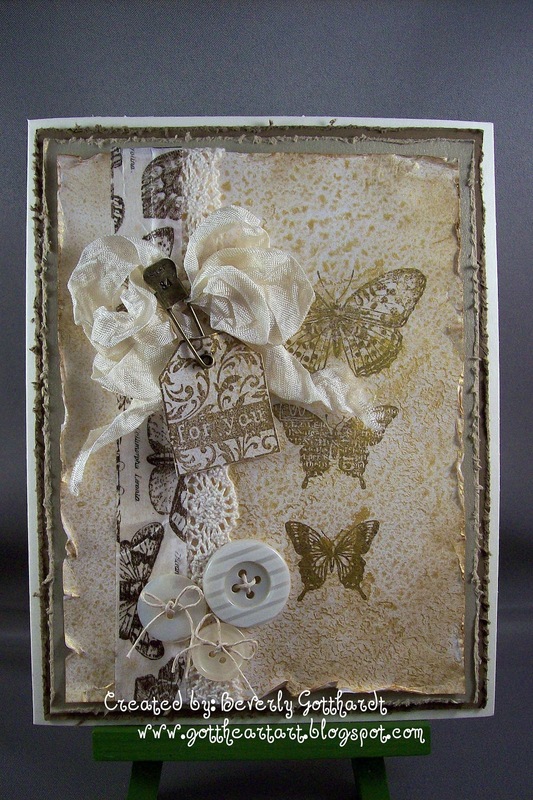 Supplies: Ivory Card Blank 5" X 61/2" Halcraft, Papers: White card stock unknown, SU-Soft Suede, Brushed Gold, Stamps: CTMH-C1299 Butterfly Kiss, SU-Bliss, Too Terrific Tags, Ink: SU-Soft Suede, Radiant Rain-Solar Gold shimmering mist, Tim Holtz ideaology-Trinket Pins, Tissue Tape, SU-Very Vanilla Seam Binding, lace-Offray, hemp cord unknown, buttons from stash, glue dots. This is just dripping with shabby chic-a-liciousness! One of my faves! Thanks for playing at OCC! Just a beautifully shabby look. So glad you could play along this week at Our Creative Corner! I like the different butterflies on the main piece and the trim piece. How creative! and the different buttons add real visual interest! Thanks for playing along with us @ OCC! I hope we get to see more of your talented work! I know i'm a little late getting over here to comment this, but I had to say I think it's fabulous! 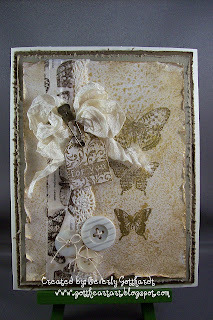 That sprayed background paper is wonderful and I love the gold embossing. Nice work with the lace, buttons and shabby seam binding too! PS - Always great to see you joining in the fun with us at Our Creative Corner! Just gorgeous! Love all your layers.